Here’s the latest progress.I was bit stuck with that corridor animation scene, so I took off a bit, and started to model outside view of the space station. I also wrote small back story that may appear in animation as narration. It was 217 years later of Hermann Weyls wormhole theory when humankind finally achieved first practical wormhole travel engine. 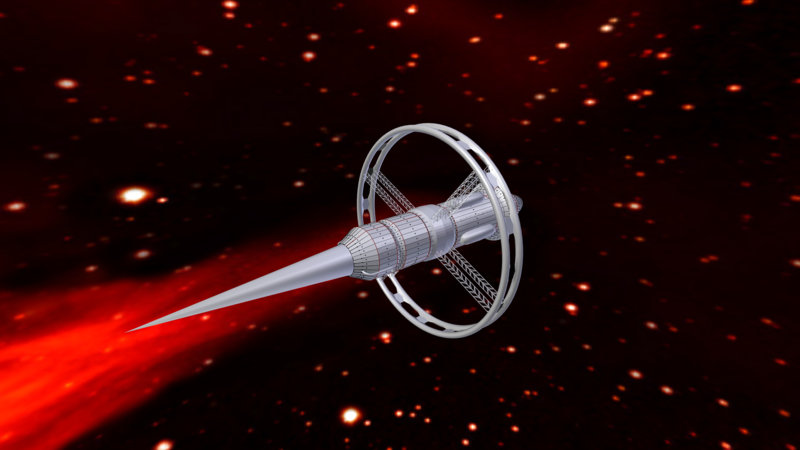 Only a two years ago United Nations of America had founded space program to engineer a space station able to travel by bridges of space-time, so called wormholes. During these years whole earth concentrated it’s economy and resources to build these two sister ships, United Nations Space Station Umbra and Antumbra. 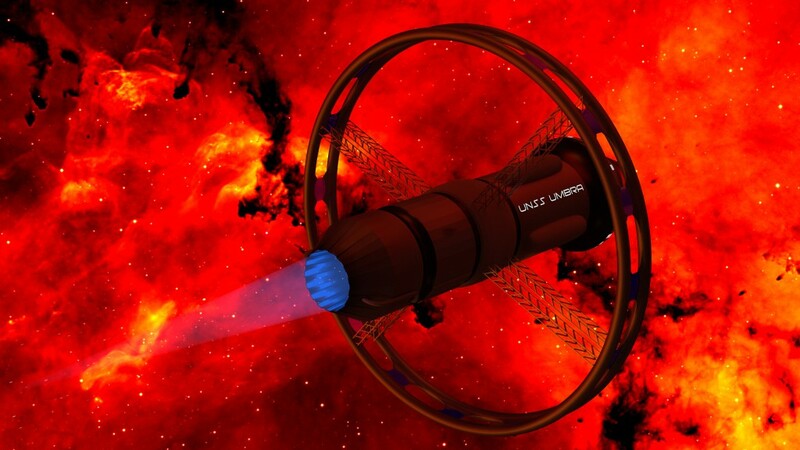 They were meant to start the next level of space age, interstellar human inhabitation. First of stations, Umbra, was launched on Thursday, 28th of August 2138. It had crew of 42 person. As it’s quantum drive started to gather critical mass, Umbra disappeared, and was not heard ever after. Umbras sister, Antumbra, was never launched. Broken space station can be seen in front of nebula. 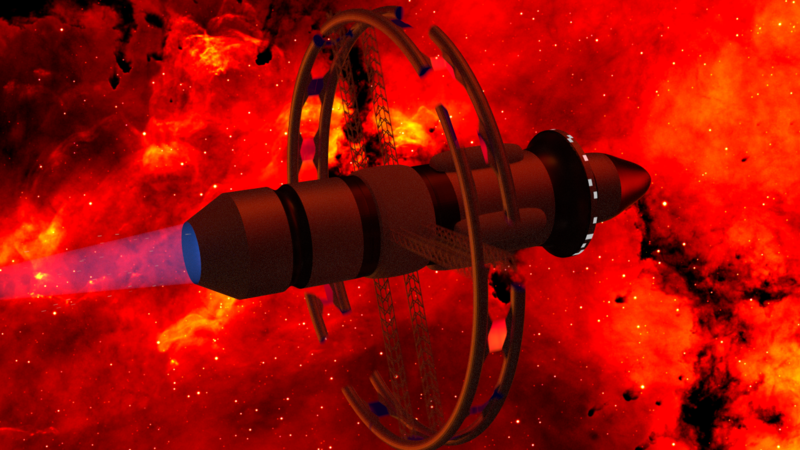 It’s quantum drive ring has been broken, and station spins slowly without seeming life. Camera then cut’s inside the dead station. This gave me better idea where to go with animation. Now I had milieu where to put this station and also got name for it. Henceforth this station shall be named UNSS Umbra. Please say if this sounds silly or too cliché, while I can still change details. I can’t make myself to stop putting small easter eggs and notations of other sci-fi movies and books everywhere. So I got this far in last 24 hours. I got this model made very fast as I have learned more of Blender software. With all kinds of modifiers and tools I can make manual labor to automated process, like creating large shapes from one small part with array modifier (see those pillars connecting large ring to station. This kind of scene is forgiving what goes to small details. I can make things look good in render with little effort, just put little texture paint there and here and make things freehand. Very refreshing after using uncounted hours to that corridor scene. 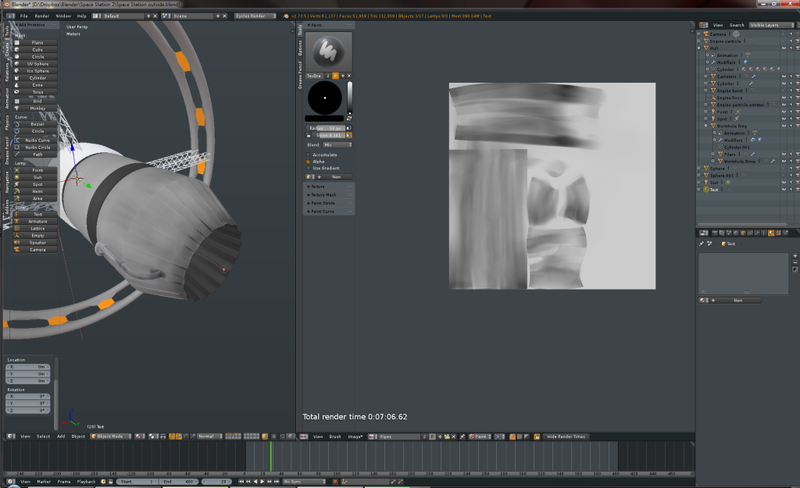 I also learned how to use blenders particle system. 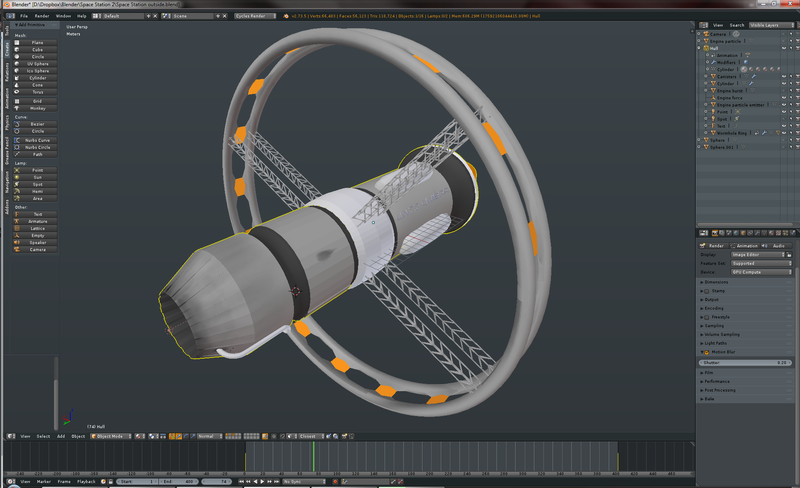 With this I can make flying sparks and other physics simulated stuff, like dust in air. I could use that more in inside parts of animation. There is also a tool that can fracture and break objects, useful for this animation scene as backstory says stations wormhole drive broke after first jump, and was left to drift in space without way back or forth. Now it is stuck somewhere, years of slower than light travel to closest exoplanet it was destined. Luckily it has powerful fusion reactor and large ion thruster. It also has fuel and necessities for small crew to survive. Though without way to contact home it’s crew has sink in state of despair. Here is more finished 4k resolution render. That engine effect is spectacular, it looks good on animation. I have much more ideas in my mind for short movie. Pictures for prologue of faceless people sitting in UN command center, space station in earth orbit under construction, explosion of wormhole engine belt, small scenes and things. I also though of making scene about command bridge of this station, where space can be seen from huge front windows, and bridge is full of computer stations like in Apollo era NASA command center (well it is still nearly identical these days, the only have added some flat screens on desks). 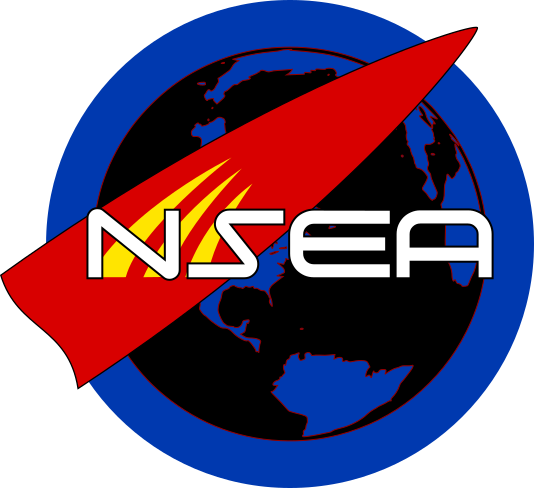 Speaking of NASA, I invented fictional counterpart for it, NSEA, National Space Exploration Agency. With all these ideas, I don’t know where to go, and if I can ever get this finished only by myself. There is so much work in different fields I’m not fully familiar. Image of background nebula based on data obtained as part of the INT Photometric H-Alpha Survey of the Northern Galactic Plane, prepared by Nick Wright, University of Hertfordshire, on behalf of the IPHAS Collaboration. The copyright of these images is “Nick Wright / IPHAS”.